This blog is all about Free Games. Not only are they free to download, they are also Free to share, study, modify and improve! I hope to bring you the best the FOSS World has to offer gamers! 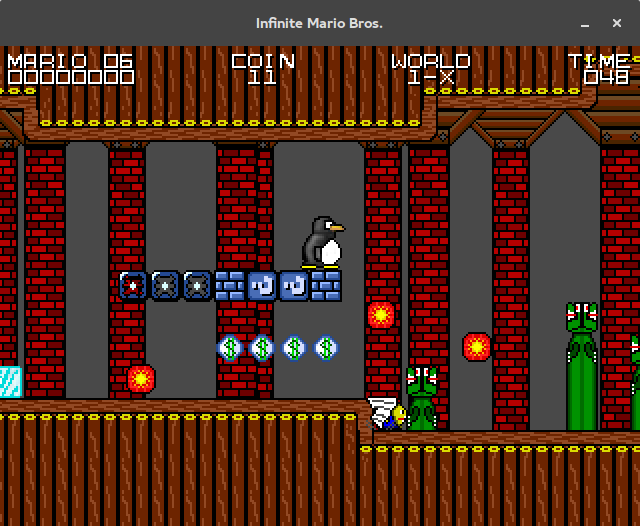 Infinite Tux is a free and open source variant of a game called Infinite Mario and replaces the proprietary graphics with free alternatives. The game generates platforming levels procedurally so you will always have something new to play. It creates both worlds and levels and seems to play really smooth and well. Have a go if you fancy some fast-paced platforming! Running along the platforms in Infinite Tux. Java? :-( I hate java soft. It's bloat.